Hello students, it’s Shayna from EspressoEnglish.net. There are many English words that have similar spellings and pronunciations, and it’s common for English learners to use the wrong one. Today I’m going to teach you three examples of how small differences can change the meaning of the word completely. Pay close attention to make sure you’re saying and writing these words correctly! These are just a few of the words that students often mispronounce. To get more pronunciation practice, you can join my American English Pronunciation Course. A college is an institution of higher education, similar to a university. This word is pronounced COLL-ege with the stress on the first syllable, and a “soft g” like in general and age. The word collage is different by just one letter. It’s pronounced col-LAGE with the stress on the second syllable, and the “g” is pronounced like the “zh” sound in pleasure. A collage is a collection of different materials or pieces that are put together into one piece of artwork. Finally we have the word colleague – this means someone you work with (you can also call this person a co-worker) or someone in the same profession. It’s pronounced COL-league with the stress on the first syllable, and in this case the “g” is a “hard g” like in get and leg. The “ue” is silent. Our next pair of words is message and massage. A massage is when someone uses their hands to touch and press your body, helping you relax. It’s pronounced mas-SAGE with the stress on the second syllable. In this case the “a” in the second syllable sounds like the “a” in father, and the “a” in the first syllable has more of an “uh” sound. Finally we have course and curse. The word course has many meanings, one of which is a program of study, like an English course! The “our” in course is pronounced exactly like in four and store. A curse is a bad thing, it’s a wish for evil or misfortune to happen to someone. It can also refer to using bad/offensive words. The “ur” in curse is pronounced “er” like in bird and first. As you can see, a small pronunciation mistake can result in a big change in meaning! This is why it’s important to have clear and correct pronunciation in English. Remember that excellent pronunciation isn’t something you can get overnight – it takes lots of practice and training. 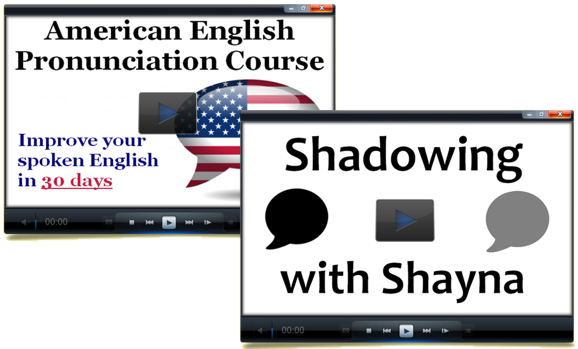 You can get some of that training in my Pronunciation and Shadowing Courses, which will give you lots of opportunities to listen and repeat. When you’re confident that your pronunciation is good, you can speak English without fear. I hope to see you inside one of my courses.